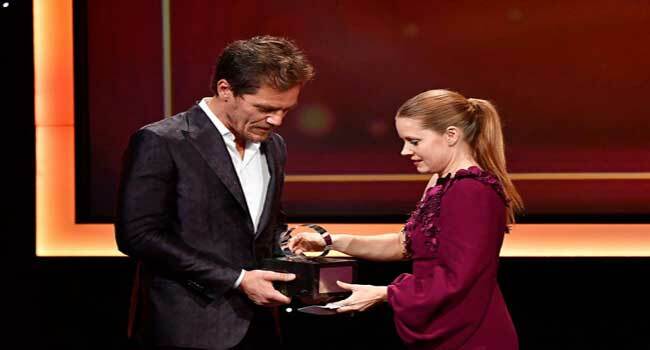 Scandal-hit Hollywood left its woes behind Friday to honour Amy Adams for a glittering career that has seen her go from waitress to five-time Oscar nominee. “I’m always happy when I show up at work and she’s there,” Michael Shannon, who starred alongside Adams in 2016 neo-noir thriller “Nocturnal Animals,” as well as two “Superman” movies, told reporters. Adams’s four other Oscar nominations were for best actress in “American Hustle” and supporting-actress roles for “Doubt,” “The Fighter” and “The Master” — but she has never won the coveted statuette. “I think Amy and I have the same attitude about it. We just feel fortunate that we’re a part of this business to begin with,” two-time Oscar nominee Shannon told reporters. She did not tread the boards in high school but took a job at a theater where she worked as a waitress. Her first film role was as Leslie in “Drop Dead Gorgeous” (1999), which tells the story of girls in a Minnesota town competing in a beauty pageant. Her co-star in the film, Kirstie Alley, recognized her star power and urged her to move to Los Angeles. Villeneuve, who directed Adams in “Arrival,” told reporters he was captivated by her performance in “The Master,” Paul Thomas Anderson’s acclaimed 2012 psychological drama. “I thought what she did in this movie is unique in her filmography. It was quite striking,” he said.